Whether you have a firearm present in your working environment, or you shoot as a hobby. To ensure it doesn’t fall into the wrong hands, it is your responsibility to ensure your firearms are protected at all times when not in use. Our gun cabinets, shotgun cabinets and gun safes meet the necessary British Standards for police approval; without breaking the bank. Your gun cabinet needs to be bolted firmly to the floor or wall in the corner of a room so it can’t easily be removed or attacked by an intruder. The keys to your gun safe or cabinet should be kept on your persons at all times, or stored in a safe that’s stronger than the cabinet itself. If you want to eliminate the risk of losing your keys, we have gun safes available with combination locks or fingerprint access. 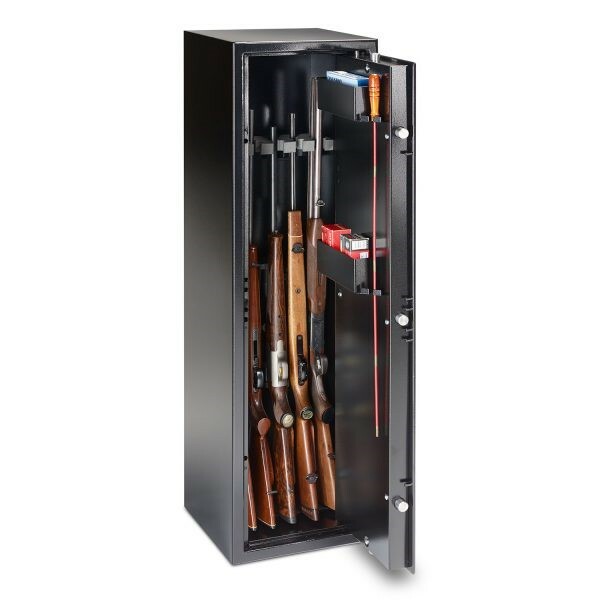 With legislation changing over the years, we ensure that the gun safes we sell are manufactured to comply with the most recent British Standards for police approval. If you own an older gun safe, it may not meet current British Standard, however, this will generally be overlooked if the gun safe was purchased before legislation was changed. At Thornhill Security, we can assist you when choosing the right gun safe to suit your personal needs and ensure compliance with legislation. For more information, give our team a call today on 0117 967 4994 or view a small selection of our gun safes below.